Keyboards have been with us for a long time. If one includes typewriters, keyboards have been around for well over a 100 years. The computer keyboard came into existance with the old teletype machines. We had one in high school back in…the day. They were hard to press, uncomfortable to use, and like typewriters were physically attached to the printing mechanism. Modern keyboards, defined as a separate low-cost peripheral, came into being with the personal computer revolution of the 70’s. The keyboard’s shape, size, and key placement varied somewhat, but fundamentally has remained the same. In many ways, however, today’s keyboards are a far cry from those of forty years ago. Those of us who sit in front of a computer (and type) for most of the day know the importance of an ergonomic keyboard: one which is comfortable to use, full-featured, and whisper quiet. Here at RainyDayMagazine, we are in constant search of better ones. The iRocks wireless keyboard we have been using for the past two years had pretty much everything we wanted: wireless, low profile, short key travel, good feel, and works on both Mac and PC. The ONLY reason we would consider upgrading our keyboard is if we could find one with really good back-lighting. 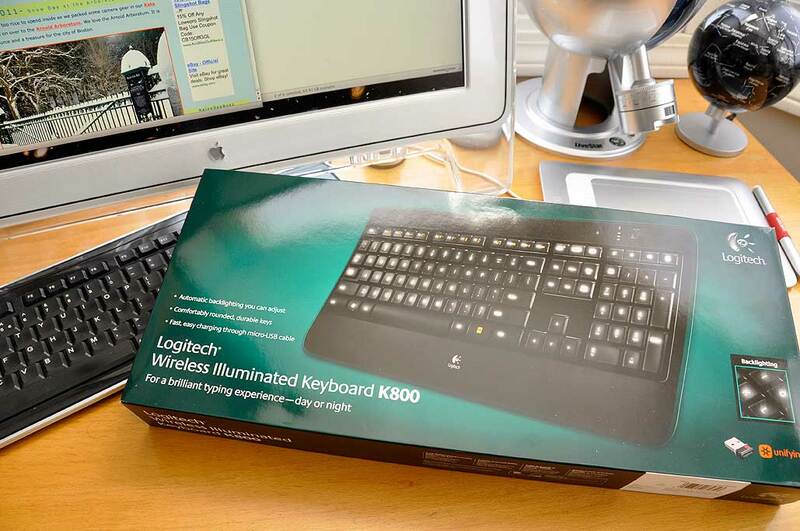 The search led us to the Logitech K800 wireless illuminated keyboard. The most exciting features of this keyboard are, fittingly enough, the keys. They are sculpted to conform to the fingertips. The key system distributes typing force evenly across key surfaces, making the keystroke comfortable, fluid, and whisper-quiet. Sensors detect the hands as they approach the keyboard and will turn the backlight on and off. The keyboard automatically adjusts the backlighting to suit the lighting conditions. Or they can adjusted to desired levels with the press of a button. Unlike some other illuminated keyboards, only the characters are illuminated. While Logitech does not list this keyboard to be Mac-compatible, our experience with their other keyboard has shown that it worked just fine with the Mac. We expect the K800 will do the same. Come back and check out the FirstUse report later in the month to find out.